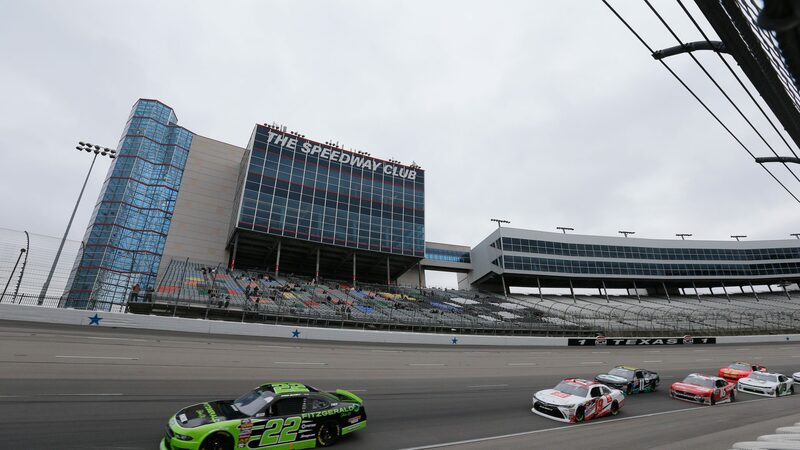 This week the NASCAR Xfinity Series visited the Texas Motor Speedway located in Ft. Worth, TX for the 200 lap My Bariatric Solutions 300. The wide 1.5 mile high-speed oval is the fastest track in NASCAR. At some points during the lap the cars run flat out, reaching speeds well over 189 MPH. Clint Bowyer, described the track, as having good tire grip, but once the track gets away from the driver, it’s like driving on ice. The story of the weekend was the unseasonably cold temperatures; there was a 51 degree drop in temperature overnight. It went from 85 to 34 degrees at race time. This greatly complicated things for the drivers, as the cars were set up for much warmer weather. Native Ohioan, Ryan Blaney, took the pole for Team Penske with a speed of 189.88 MPH. (Interesting note: I know Ryan’s Uncle Dale Blaney, who is a legendary dirt track, Sprint Car racer from Hartford, Ohio.) I met him while following the Midwestern dirt track scene. You might remember his father Dave Blaney, who raced in NASCAR for 17 seasons. Ryan is a third generation racer. The green flag dropped and the cars jockeyed for position racing in a loud colorful train. The cold weather did as expected causing the cars to slip and slide all over the track. By lap 3 we had the first yellow of the day for a spinning Chad Finchum. On lap 10 Jamie McMurray spun into the infield, bringing out the second caution flag of the day. Amazingly McMurray, kept the car from hitting the wall, allowing him to continue racing with only minor damage. On lap 17 the #01 hit the wall bringing out the third yellow of the day. The cars re-started on lap 21 bumping and banging with splitters glued to the track. The Penske machine of Blaney lead from the first lap to the end of stage one at lap 45, winning the stage. On lap 48, early in the second stage the lead cars pitted. The Team Penske crew got Blaney out first with an amazingly fast & flawless pit stop. Later in stage 2 the GMS machine of Spencer Gallagher spun bringing out the 5th yellow flag of the day. Gallagher skillfully kept the car from hitting the wall. Blaney lost the lead due to a bump and run move made by Christopher Bell. The yellow flag reared its ugly head once again for Chad Finchum, who hit the wall hard this time ending his day. At this point Blaney fell back to third and Brandon Jones took the lead to win stage 2. At the halfway point in the My Bariatric Solutions 300; the #21 RCR car of Daniel Hemric, had the lead with the #22 Team Penske car in hot pursuit. Blaney quickly moved through the field of cars and before you know it the native Ohioan is pounding on the rear fender of Hemric, pressuring Hemric to make a mistake. With only 46 laps to go, Ryan Blaney was back in the lead and beginning to gain some distance on the thundering herd of cars. With 37 laps to go the #22 pulled away from the #21 machine. From that point on Blaney just had to keep it between the fences and keep the rubber side down to get the victory. After the victory Blaney gave the race flag to a young child in the stands. Blaney said he enjoys giving young fans the opportunity to “make a memory that last a lifetime”. He further stated that his car was fast all day and that the Team Penske crew did a great job. Somewhere “Captain” Roger Penske is smiling. This wild race lasted 2:24:01 hours and averaged a speed of 124.986 MPH, with a total of 8 caution flags for 42 laps. The top three Xfinity Series points leaders are: Elliott Sadler 228 Pts., Tyler Reddick 217 Pts. & Christopher Bell 208 Pts. As a fan, it was great to watch a race where I have a connection to the winner’s family & as an Ohioan, it’s nice to see a fellow buckeye take the victory! I look forward to many more years of watching this young talent bloom.